Mo’ Creatures is a 3rd party mod for Minecraft which adds a huge number of alive creatures (animals) in your World. The creatures include Horses, Butterflies, Turkeys, Unicorns, Cat, Dogs, Wolfs and much more. Every creature has different armor, damage and attributes, you can pet them or kill them for food. Mo’ Creatures is a must have mod for Minecraft. Description: A custom mod for Minecraft. 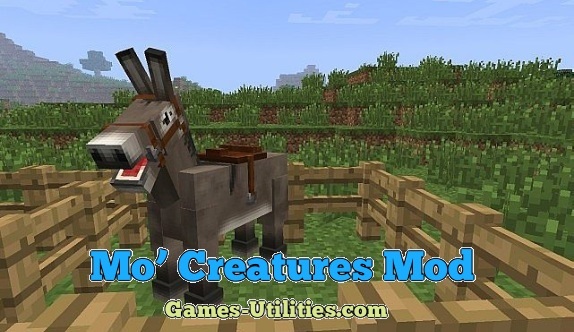 • Download the Mo’ Creatures modification from the link above. • Go to Start Menu > Run > Type %appdata%/.minecraft and hit enter. • Please keep a backup of your Minecraft saves before downloading/installing any Mod. • To avoid any unwanted errors/problems, please install this mod on Fresh Minecraft. • Please visit official thread of this mod for more information.